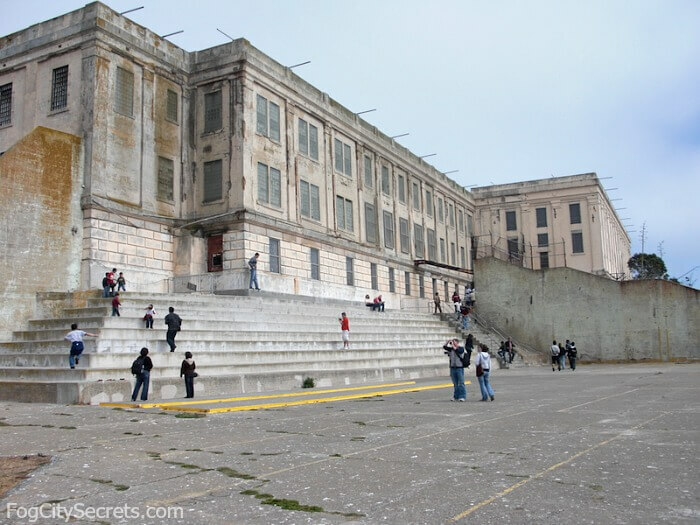 A local's guide to choosing the best Alcatraz tours, and how to save money on booking Alcatraz tickets. Here's the inside scoop on how the Alcatraz tours and tickets work: my secrets on navigating the system! What if Alcatraz is sold out for the dates you want? It's still possible to get tickets! See my page on the four ways to get last-minute Alcatraz tickets for sold-out days. Tickets for Alcatraz go on sale 90 days in advance of the tours. These tickets book up, so get them as soon as you know your travel dates! Single Alcatraz tickets or Alcatraz combination tours? You can get tickets just for Alcatraz or you can book a package that combines Alcatraz with some other fun San Francisco attractions or activities (see information on combo tours below). The best way to get the Alcatraz tickets is to purchase them directly from Alcatraz Cruises (alcatrazcruises.com), the "official" seller of the tickets and the company that runs the only ferries out to Alcatraz. Not only are the prices a lot higher than with the with official seller, alcatrazcruises.com, you don't get to pick your dates and times directly and you'll have to stand in line to exchange your voucher to get a ticket! So how do those companies sell individual Alcatraz tickets? They "sell" a ticket to the customer (for considerably more that the official ticket costs), then go to the alcatrazcruises.com website and buy the ticket in your name with the credit card you provided. Problem: aside from being overcharged when you book from them, you also can't see the available dates and times for the tours and you can't just download the ticket and print it out like you can from Alcatraz Cruises. So basically you're paying them to buy the ticket from Alcatraz Cruises for you, with your credit card. It's legit, but why bother? Why not just go directly to the source and pay a lot less. Plus, you won't have to wait in line at the ticket booth at Pier 33 to exchange your voucher for a ticket. You can get right on the boat with the ticket you print out from Alcatraz Cruises. Inflated prices: one major company you'll see in the search results sells the official $39.00 adult day ticket for $45.45, plus a $2.99 service charge per ticket, plus a $6.95 processing fee per order: total = $55.39! You get nothing extra with that, and if the official company, Alcatraz Cruises, is sold out, they are sold out as well. Plus, you have to select three possible departure times when you book, and they'll give you one of your choices in order requested (if available) so you don't know which departure time you are getting, if any, when you book it. When you book directly with alcatrazcruises.com, the price is a lot cheaper, and you choose the departure time you want from all those available at the time. You know which tour you're doing when you book the ticket. The official ticket company has no "service" fees or "processing" fees tacked on. Another prominent company you'll see in the search results sells the $39 adult ticket online for $46.00. Package tours. Alcatraz Cruises does sell bundles of tickets to approved tour companies who combine them with other tours. Buying the packages that include Alcatraz is a popular way to get tickets for Alcatraz, and basically the only way of getting deals. 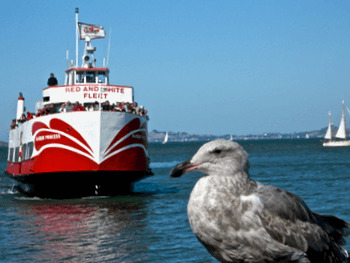 Are you thinking about visiting Muir Woods or Sausalito, doing a bay cruise, or taking a city tour? There are no bargain or discounted tickets for Alcatraz per se, but if you are planning to take another tour or tours while you're here, you may save some money by doing a combination of Alcatraz plus another attraction(s). See the list below. Alcatraz & Hop On Hop Off Bus Tour. 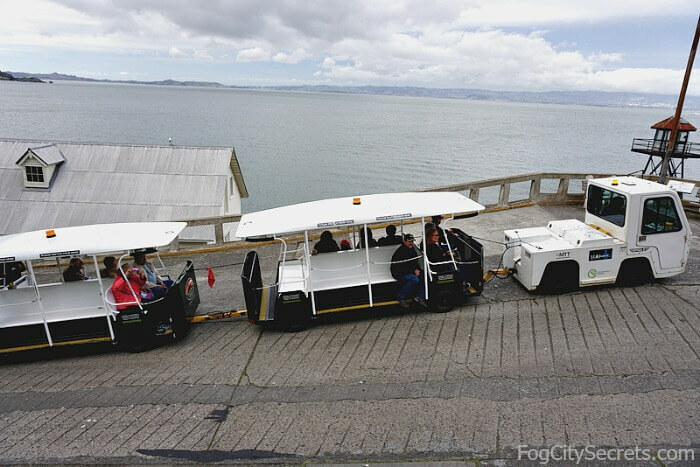 Get a 2-day pass on the hop on hop off tour bus that hits most of the main San Francisco sights (including Sausalito), and a visit to Alcatraz. $139.99. $10 off if booked online. See Hop On Hop Off & Alcatraz for info and booking. Alcatraz plus a City Bus Tour. See the city sights by bus, with photo stops at the Golden Gate Bridge, Golden Gate Park and more, and visit Alcatraz, all in one day. Hotel pickups and lunch included. $120. See Alcatraz & City Tour for more info and booking. Alcatraz & Sailing on the Bay. 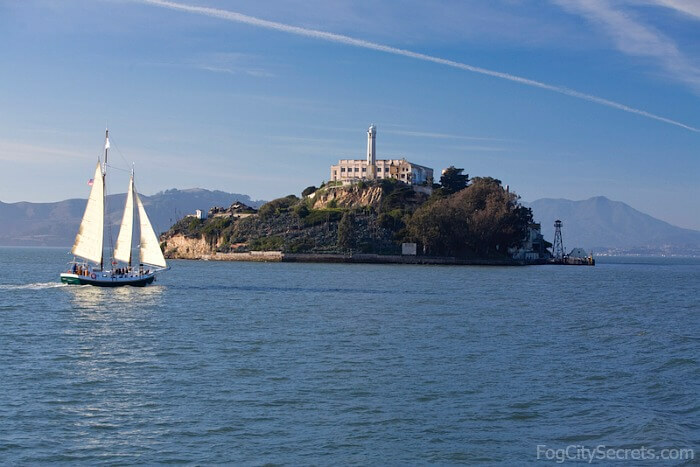 See Alcatraz, plus sail the bay on a catamaran. Very relaxing, and great views out on the water (and goes under the bridge - very cool). $97.65. See Alcatraz & Sail the Bay for info and booking. Alcatraz and a Guided Bike Tour. 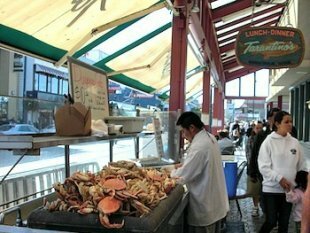 This is a 2-day tour, with a visit to Alcatraz one day, and the day before, a guided bike tour through the waterfront, over the Golden Gate Bridge, and down to the seaside town of Sausalito. $99. See Alcatraz and City Bike Tour for info and booking. Alcatraz and Craft Beer Tour. Spend the morning exploring Alcatraz and the afternoon touring and tasting with a guide at three local brewpubs. $129. See Alcatraz and Beer Tour for more info and booking. Alcatraz plus the Go Cars. Tour the sights of San Francisco in a GPS-guided Go Car. This combination includes a trip to Alcatraz plus 2 hours of sightseeing in a Go Car. $255.45. See Alcatraz & Go Cars for more info and booking. Alcatraz & Wine Country. See Alcatraz, then spend a full day touring wineries in Napa and Sonoma counties. One of the best things to do while you're here! $279. See Alcatraz & Wine Country for info and booking. Alcatraz & Helicopter Tour. For some spectacular views of San Francisco from the air, ride a helicopter over the city and the Golden Gate Bridge, along with a tour of Alcatraz. This is a highly-rated tour. I see this helicopter flying over my house every day and it's on my bucket list! $245. See Alcatraz & Helicopter Tour for info and booking. Or check out Alcatraz combo tours to see a list of the many combinations available; there are lots! If you want some great attractions all rolled into one package, there's a convenient tour combination that gives you Alcatraz, Muir Woods, Sausalito and a San Francisco city tour, all in one day. This tour is given by Dylans Tours, a highly-rated, local tour company. $169. 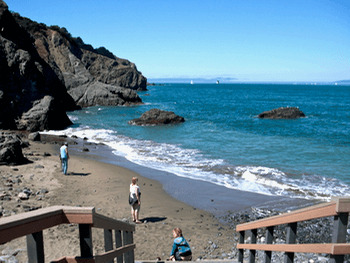 For more info and booking, see the Alcatraz, City Tour, Muir Woods & Sausalito combination tour. Jail and Sail Tour. This is a really popular tour that tends to book up, but if you can book far enough ahead, snag this one. In addition to a visit to Alcatraz, you get a 2-hour evening cruise around the bay as the sun sets, with beer, wine, snacks and guitar music - very nice. $120. See Jail and Sail tour for info and booking. Now you can get Alcatraz Night Tour combos! Just in the last year, some tour companies have started offering the harder-to-get, Alcatraz Night Tour in combination with other tours. They've got some interesting, longer trips, as well as a popular Muir Woods and Sausalito combo. Alcatraz Night Tour & Muir Woods and Sausalito. Explore the big trees in Muir Woods and the seaside village of Sausalito during the day, then head out to Alcatraz in the evening. Doing the Alcatraz night tour gives you plenty of time to explore Sausalito and to take the ferry ride back to SF - very pretty. $179. See Night Tour, Muir Woods and Sausalito for more info and booking. Alcatraz Night Tour & Wine Country. See Alcatraz one evening, then spend a full day touring wineries in Napa and Sonoma. Small group tour, plus ticket for Aquarium of the Bay at Pier 39. $289. See Night Tour & Wine Country for info and booking. Alcatraz Night Tour & Silicon Valley. Want to see the headquarters of some of the big name tech companies in the Silicon Valley? Explore Alcatraz one evening, then head off to the Silicon Valley for the day. See the HQ of Facebook, Google, Apple, and the Computer History Museum. $209. See Night Tour & Silicon Valley for info and booking. Alcatraz Night Tour & Yosemite. See Alcatraz at night, then do a full-day bus tour the next day to beautiful Yosemite, with several hours free time to explore the park in addition to the tour. Plus, a ticket for the Aquarium of the Bay at Pier 39. $269. See Night Tour & Yosemite for info and booking. Alcatraz Island is administered by the National Park Service. All the tours on the island are free and are given by US Park Rangers or volunteer guides. The ticket to Alcatraz pays for the ferry ride out to the island and includes all the activities once you're on the island. The only thing you have to pay for once you're out there is bottled water or shopping in the gift store. All the tickets for the Alcatraz ferry are sold by AlcatrazCruises.com. You can get the tickets either directly from them (via their website or ticket office), or through third parties (other tour companies) authorized by them to combine their tickets with other tours. Tickets for Alcatraz aren't transferable. They are issued in the name of the purchaser, and once sold, can't be resold (to deter scalping). 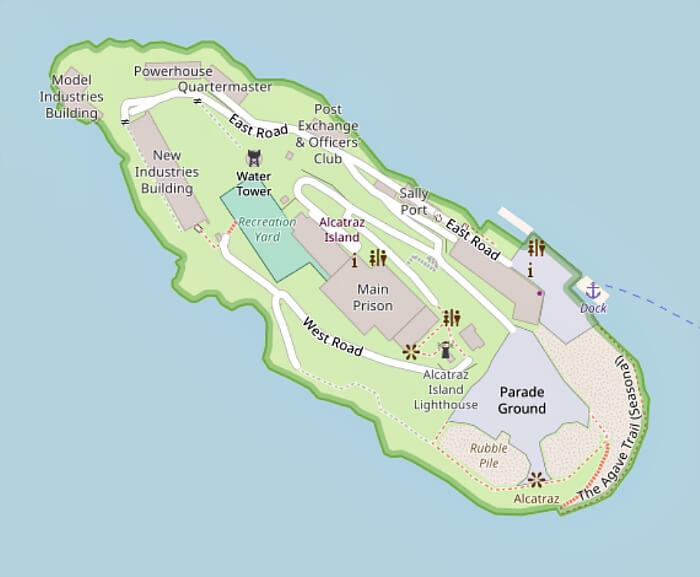 How do you get out to Alcatraz Island? The only way to get out to Alcatraz Island is to buy a ticket for one of the Alcatraz ferries. These are the only boats that stop at Alcatraz and allow you to get off and explore the island and prison. The ferries out to Alcatraz Island are run by Alcatraz Cruises (alcatrazcruises.com), part of the Hornblower Yacht Company, which currently holds the Alcatraz ferry concession. How often do the ferries run? The Alcatraz ferries for the day tours run seven days a week, starting at 8:45 am, and leaving about every 30 minutes during the day. The ferries for the night tours and the Behind the Scenes tours run four nights a week, Thursday through Sunday. There are two sailings each evening (one sailing in winter). Where do you catch the Alcatraz ferry? The ferries leave from Alcatraz Landing, located at Pier 33 on the San Francisco Embarcadero. How long is the ferry ride to Alcatraz? The ferry over to the island takes about 15 minutes. The views are spectacular: the city skyline, the Golden Gate Bridge, the Bay Bridge, SF Bay and Angel Island. For more information on taking the ferry, plus how to get to Pier 33, and suggestions for parking, see my page on visiting Alcatraz. What do you get with your Alcatraz tickets? Note: there are also Alcatraz cruises that go around the island (see below for my recommendations), but don't allow you to visit Alcatraz itself. They are great fun too (see my page on SF Bay Cruises for tips on the different cruises), but that may not be what you were looking for. So read carefully about the tour being offered. Book early. In summer, especially on weekends, and around holidays, these trips are very popular. The Alcatraz ferries get sold out, weeks or months in advance, so it pays to plan ahead. 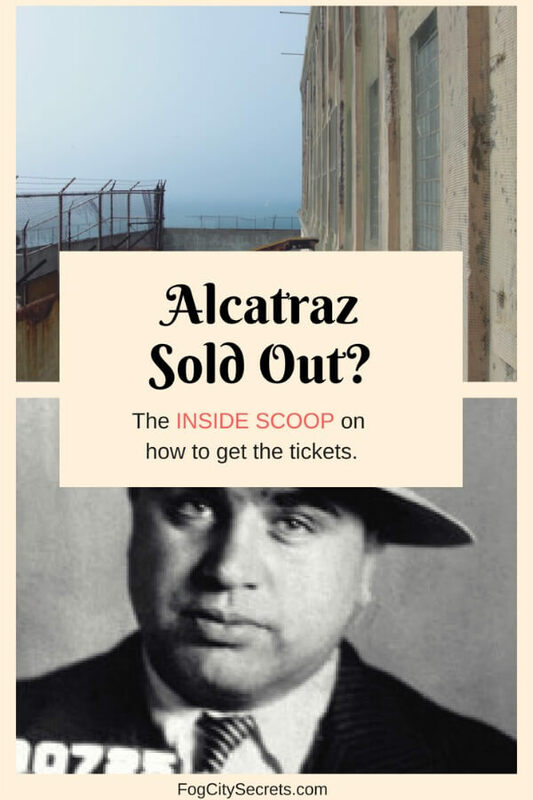 There are ways to get tickets when Alcatraz is booked-up, but it's better to buy them well in advance if you can. Alcatraz sold out? There are ways to get tickets for sold-out days, for both the day and night tours. If you find yourself in this situation, check out my tips for getting last-minute tickets. It can be done! Save money. Buy individual tickets directly from www.alcatrazcruises.com (the official company) or get a combination package (see combo tours). Avoid the lines. If you buy your tickets online directly from www.alcatrazcruises.com and print them out (or use the mobile version), you won't have to wait in a line to (a) buy a ticket, or (b) pick up your "will call" ticket when you get to Pier 33. E-tickets. If you buy your tickets online, you can either print them out or use your mobile phone version. They can scan either format at the boarding gate. If you have a voucher, exchange it for a ticket at Pier 33. Discount passes. Can you visit Alcatraz on the Go San Francisco Card, San Francisco CityPass, or San Francisco Wharf Pass cards? Yes, but only if you buy the cards from the Alcatraz Cruises company at Pier 33 or by phone through their company at 415 981-7625. Hardest times to get tickets: June, July & August, plus around the Christmas/New Years holidays, Easter break, Memorial Day (end of May) and Labor Day (beginning of September). And to a lesser extent: April, September and October. In other words, just about any time can be tough to get tickets, except for January, February and early March! Alcatraz Sold Out for the dates you want? Don't despair! There are ways to get tickets, even for the same day. I've given all the steps of how to do it on my page, Last Minute Alcatraz Tickets. Also, see below for some Alcatraz combination tours that might have tickets for sold-out days. Alcatraz is closed on Thanksgiving Day, Christmas Day and New Year's Day. Also, the Night Tour and the Behind the Scenes Tour don't run on July 4th, Christmas Eve and New Year's Eve. Something cool for Bay Area residents. Residents get a good deal on Alcatraz tickets during the slow season. The Buy One Get One Free sale is available for Day Tours on select dates in January and February each year. See BOGO tickets for the list of eligible Bay Area counties, booking and more info. The bleak remains of Alcatraz prison sit on a windy island in the middle of San Francisco Bay. Every year, over 1.4 million people visit Alcatraz, definitely one of the most popular of San Francisco attractions. A fascinating spot - both creepy and beautiful! Highly recommended. The dark history and sense of isolation seem to seep out of the penitentiary's damp walls. It's no Disneyland ride; this is real and has a rough edge to it. Plenty of "atmosphere"! Lots of people have said this was their favorite San Francisco attraction. Once you're on Alcatraz, in addition to seeing the prison itself, you're free to explore the island, including the Civil War era buildings, seabird nesting areas and the Alcatraz gardens. 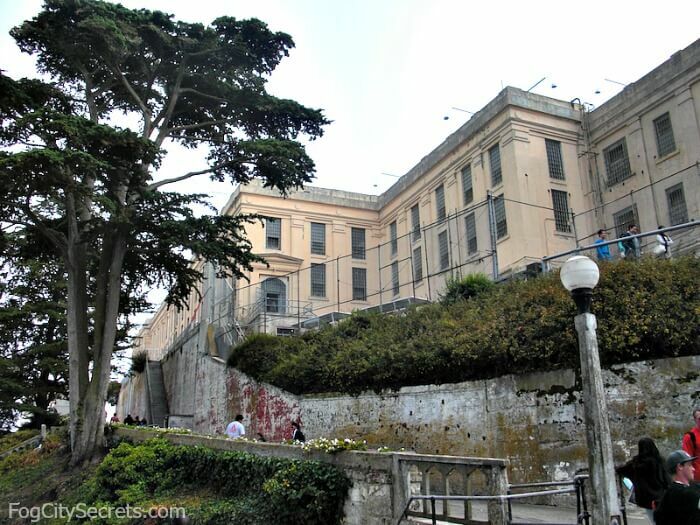 You'll be able to walk the halls where Al Capone and Machine Gun Kelly did their time, and see the solitary cells where the Robert Stroud, Bird Man of Alcatraz sat out most of his sentence. 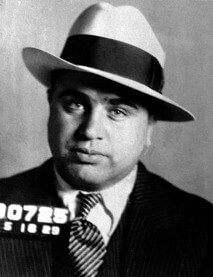 The first floor of the prison cell block is open for visitors to explore; the audio tour directs you through the prison to see various places of interest, like Al Capone's cell (B 181, on the second tier of cells near the starting point of the audio tour. The cell door is open and the light is on, but it's not labeled as his cell). 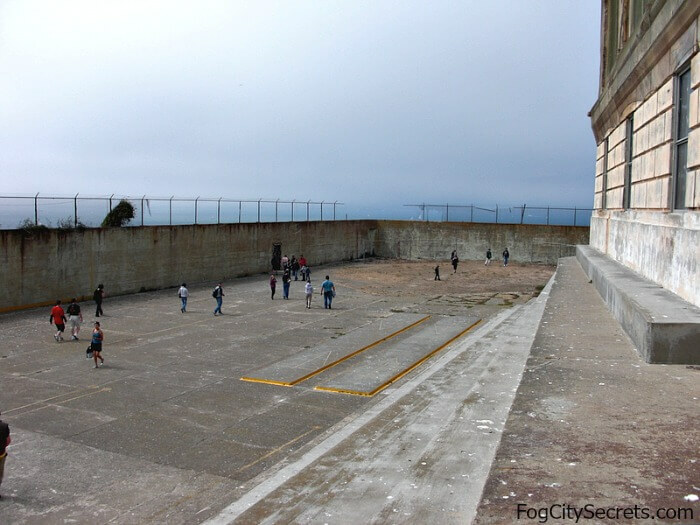 The former prison exercise yard is also open to visitors; from there, you can see how close San Francisco must have looked to the inmates. They had a great view of the Golden Gate Bridge, too! Some areas are off-limits due to safety issues or fragile historical artifacts, mainly on the second floor of the prison, but some of those areas are included on the night tour or the Behind-the-Scenes tour, like the Civil War tunnels and the basement cells. Times and prices have changed. For all the tours, check the current schedule and ticket availability on their website: www.alcatrazcruises.com. The Early Bird Tour. The first tour of the day is called the Early Bird Tour, leaving at 8:45 am. This one's very popular because it's the first boat out to the island and you can explore before it gets really crowded. This tour gets booked up faster than the other day tours, so booking ahead for this one is even more important. Spring/Summer schedule (March 11, 2019 - Nov 5, 2019). The Alcatraz Day Tours run seven days a week, and leave every 30 minutes from Pier 33 (Alcatraz Landing), from 8:45 am to 3:50 pm. Fall/Winter schedule (Nov 6, 2019 - March 9, 2020). Day tours run daily, every 30 minutes from 8:45 am through 1:35 pm. The return boats leave Alcatraz every 30 minutes; the last one leaves Alcatraz at 6:30 pm in summer (4:25 pm in winter) and you can take any of the boats back. The return times are posted at Pier 33 and at the dock on the island. In summer, there are 14 day-tour sailings out to the Rock, and 11 sailings in winter. Each boat trip carries about 200 people to the island. As the day progresses, it tends to get more crowded, since there's no time limit and visitors can take any boat back; as a result, the morning tours tend to be more popular and book up faster. How much time do you need to see Alcatraz? Allow at least 3 hours for the whole trip; you may find yourself spending more than that once you get exploring the prison and the island. Once on the island, there are free guided tours by Park Service staff and the self-guided Alcatraz prison audio tours, included in the ticket. And you are also free to explore the island and the buildings remaining from the time when Alcatraz was a fort and military prison. During the Civil War, Confederate prisoners and were held there, and during WW1, the prison held POW's and conscientious objectors. At other times, it was used as a stockade for U.S. military prisoners. How long is the ferry ride? The boat ride to Alcatraz island is about 15 minutes. There's no presentation during the trip, but the views of the city and the bay on the way over are spectacular! Views from Alcatraz. Alcatraz has an amazing view of the San Francisco skyline. If you walk down to the southern side of the island (facing the city), there's a walkway along there with a spectacular view of the city. Both the Golden Gate Bridge and the Bay Bridge are visible from this side as well. There's also a great view from the area by the lighthouse; you'll end up here at the end of the audio tour. There are fewer people on the night tours, so the prison is much less crowded and has a more intimate feel. There are interesting tours and talks by the park rangers about Alcatraz history and stories about the prisoners. 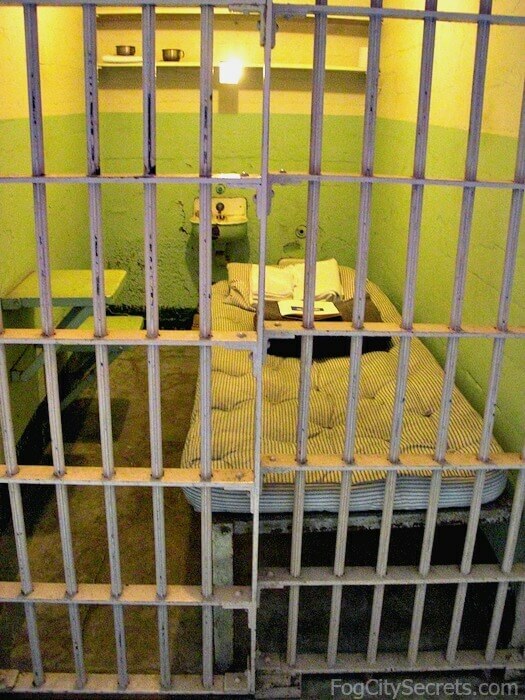 You have access to areas of the prison that are off-limits during the day tours. You circle the entire island by boat. You get to watch the sun set over the Golden Gate Bridge and see the lights all around the bay begin to sparkle. There are two night-tour sailings to Alcatraz most of the year, and one nightly sailing in winter. The night tour runs five days a week, Thursday through Monday. Each boat carries about 150 people to the island. Cruise around the island. The Night Tour ferry makes a trip around Alcatraz Island before arriving at the dock (unlike the day tour ferry, which sails directly to the dock). During the cruise, you'll hear information about the island and its history. The passengers will be let off in three groups, so that not everyone arrives at the prison at the same time. Groups are chosen by who's in line first. Each group is assigned to a park ranger, who gives a brief talk on what to see on the island, how the tours work and what activities are scheduled for that evening. The ranger takes you up towards the prison entrance, where you head inside to pick up your equipment for the audio tour. From there, you are free to explore the prison and start the audio tour, explore the other buildings and gardens, watch the film in the dock's theater, or otherwise ramble over the island and enjoy the views. There are a couple of guided tours given by the park rangers each night that take you into places not normally accessible, like the gun gallery on the second floor, and other blocked-off areas. Plus there are scheduled talks on various subjects related to Alcatraz. The topics vary from night to night. These tours and talks are posted inside the prison, just as you enter, and inside the gift shop, plus the ranger who takes you up to the cellblock goes over them as well. What to do first? Here's what I recommend. Figure out which guided tours and talks you want to go to. Then, to avoid the crowds inside the prison, go outside and explore the grounds and admire the views, and come back later in an hour or more and do the audio tour after the others have finished and left the prison. Most people do the audio tour first, and people tend to get bunched up around the points of interest the recording is telling you about, so this approach is one way to have the prison (almost) all to yourself while you do the tour! The evening's topics vary, depending on which rangers are doing them. On one of my visits, one of the guided tours took visitors to the areas of the prison connected with Machine Gun Kelly, and there was an interesting talk on the kidnappings of the 1930's (and the kidnappers who ended up in Alcatraz). 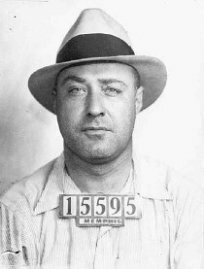 Another time we heard talks on the gangsters' bank-robbery techniques and prisoner escape attempts. At posted times during the evening, they also demonstrate the opening and closing (en mass) of all the cell doors; pretty intense! In summer, the Alcatraz Night Tour leaves Thursday through Monday at 5:55 pm and 6:30 pm from Pier 33 and lasts about 2.5 hours. You can return on either the 8:40 pm or 9:25 pm boats. The sun doesn't set until around 8:30 pm in mid-summer, so it will be light for the first couple of hours, good for exploring the island. During winter, (starting Nov 6, 2019) there is only one night tour, leaving at 3:50 pm, Tuesday through Saturday, returning at 6:40 pm. At the darkest time of year in San Francisco, the sun has usually set by 5 pm, so you'll see both the sunset and the city lights. Return times are posted at Pier 33 and at the dock on Alcatraz. The two night tour sailings (5:55 and 6:30) resume in March each year. That time of year, the sun sets around 7:15 pm, so if you take the later boat, it will be dark 30 minutes after arrival on the island. The prison is even eerier after dark, and if it's a clear night, the lights of San Francisco are truly magical. For lots more about the night tour, plus photos, see my page on the Alcatraz night tour. This one is the newest tour, limited to 30 people max. 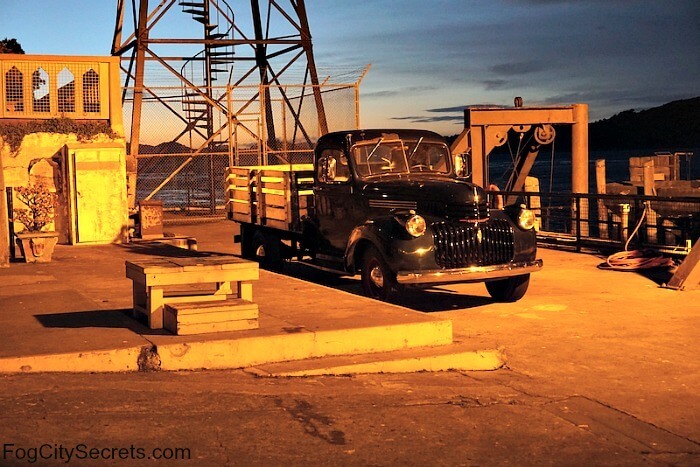 This tour starts out with a special, guided 2-hour tour of the island with a park ranger, going into places that the other tours don't go, then joins the night tour's activities for a 4 to 5 hour total Alcatraz experience. Cool places only this tour goes: this tour can take you into the dungeon cells in the basement (creepy!) and underground through a Civil-War-era tunnel leading to a different part of the island. The tour group may go inside the crumbling, New Industries building, the island factory where prisoners worked and did the army's laundry. You may also be allowed into A Block, a cellblock normally closed off, as well as the eerie prison hospital or the prison chapel. Where you actually go on the tour depends on the guide and on construction issues. There are repairs ongoing at the prison which result in certain areas not being available at any particular time, so the content of the tours is unpredictable...it'll be a surprise. But very interesting! Requirements: this tour involves a lot of walking up and down stairs and steep hills and is limited to age 12 and above for that reason. They describe this one as "strenuous". They say they don't have breaks, so eat (and whatever else you need to do) before the tour! But there was one bathroom break about half-way through when I was there. What does "strenuous" mean? I went on this tour and can reassure folks that you don't have to be really fit to do this. Basically, if you can climb one flight of stairs and walk at a reasonable pace, you can do this tour. There's plenty of standing and hearing stories interspersed with the stairs and hills. Summer Schedule: the Behind the Scenes Tour leaves from Pier 33 at either 4:20 pm or 4:50 pm, Thursday through Monday. You can return on either the 8:40 pm or 9:25 pm boats with the night-tour folks. Winter Schedule: (starting Nov 6, 2019) the boats leave at 2:10 pm and 2:40 pm, Tuesday through Saturday, and return at 6:40 pm. For more details about what this tour is like, and photos of some of the places it visits, see my page on the Behind the Scenes tour. This is a handy combination if you want to make a day of it and see both sights. Angel Island is a beautiful place with spectacular views of SF Bay. It was the Ellis Island of the West Coast, and thousands of immigrants from Asia came through Angel Island, especially during the Gold Rush era. The Immigration Station there has been made into an interesting museum, recreating the furnishings of the dormitories and common rooms; it's one of the stops on the tram tour, and worth a visit. This tour takes about 5.5 hours. The combination tours run April through October, daily June through September, and weekends only March, April and October. There are two tours per day; the first one starts with the Alcatraz tour and the second one starts with Angel Island. Tour 1: Starting with Alcatraz. This tour leaves Pier 33 at 9:30 am, gives you about 2.5 hours on Alcatraz, then leaves for Angel Island at 12:05 pm. Leaves Angel Island at 2:35 pm, back at Pier 33 by 3:10 pm. Tour 2: Starting with Angel Island. Leaves Pier 33 at 9:40 am, arrives at Angel Island at 10:30 am. Heads over to Alcatraz at 12:45 pm, arriving 1:10 pm. on Alcatraz. From there, you can take any boat back to Pier 33. Which one's better? Tour 1 gets you to Alcatraz earlier, before the crowds build up, but your time is more limited (but still sufficient). Tour 2 gets you to Alcatraz later in the day, but you can stay for as long as you like (until the last day-tour boat departure). You can also see Angel Island on your own by taking the Blue and Gold Ferry to Angel Island from Pier 41 or the Ferry Building. Once on the island, in addition to beautiful hiking trails, there are tram tours, Segway tours, bicycles for rent, an immigration museum and cafes. You could easily make a full day of it. 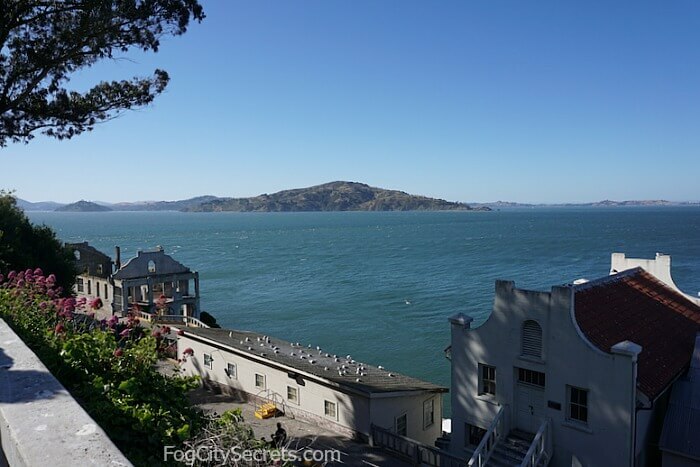 See my tips on what to see and do on Angel Island. Doing Angel Island on your own (ferry ride from SF plus tram tour) would run around $33.50 for adults, less for seniors and kids. 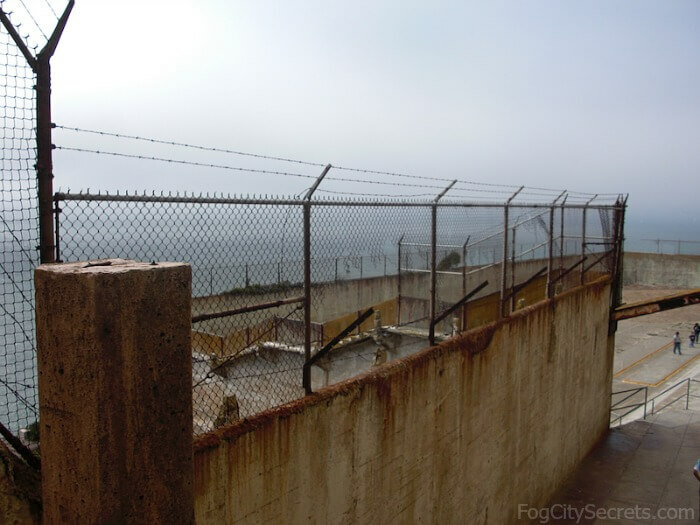 The three prisoners who escaped in 1962 were headed for Angel Island on a homemade raft. Did they make it? Possibly; some evidence suggests they did. Once on the dock at Alcatraz, you can take one of the guided tours which will lead you up the hill to the prison and finish at the cellblock entrance (day tours only). Or you can walk up the hill to the cellblock on your own, and explore the Civil War era buildings on the way up. The audio tour starts inside the cellblock. You will receive your headset for the Audio Tour after you enter the prison, following a steep climb up the hill. If you don't want to do this tour, tell the people passing out the headsets and you'll get a refund of $8.00 for adults, a bit less for others. Refunds are only available on the day tours. It really adds a lot to the experience, so I highly recommend doing it if you can. The Audio Tour is available in English, German, French, Spanish, Dutch, Italian, Russian, Portuguese, Korean, Japanese, and Mandarin. This 45-minute, self-guided audio tour is a very well-done presentation that takes you through the prison: cellblocks, dining hall, library, prison yard, warden's office, etc. You can pause it or rewind it and so take your time going through the prison. 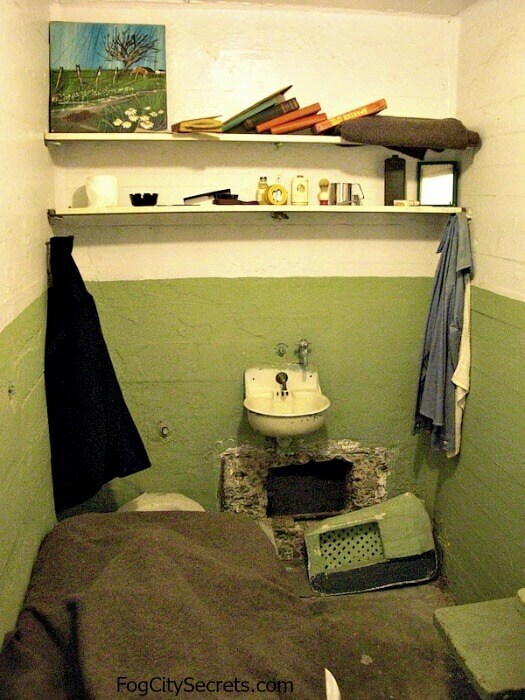 Some of the cells are set up and furnished as they would have been then: grim 9' by 5' rooms with a small cot, toilet and desk. The prisoners spent most of their days alone in their cells and talking was forbidden. Rather chilling. On the recording, you'll hear the voices of actual prisoners and guards describing their experiences at Alcatraz. The narration directs you to particular spots in the prison where interesting events took place: solitary cells where the Bird Man of Alcatraz spent most of his time, passageways where inmates crawled to escape, scenes of murders and shootouts. You can walk around in the prisoners' exercise yard and see how close San Francisco must have looked to the inmates. In spite of the desperate escape attempts, Alcatraz' location defeated them all. (Or did it? Three escapees left on a raft and were never seen again. There is some evidence two of them made it to Brazil.) The water was too cold and the current too strong. Even though the City was close enough for the prisoners to hear voices and laughter, they couldn't swim the distance: only 1.25 miles (2 km). At the end, it's sort of relief to "escape" from the oppressive atmosphere in the jail and come out by the Alcatraz lighthouse. This is where you'll have another spectacular view of San Francisco and the Golden Gate Bridge. For those who have difficulty getting up the hill, there is a tram that leaves from the dock every 35 minutes, and carries people back down as well. 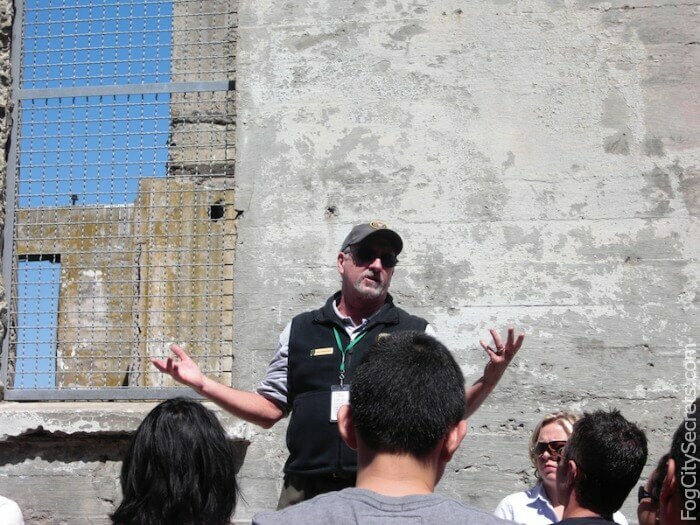 These Alcatraz tours are free and are offered on a variety of topics, like "Escapes", "Famous Inmates", and "Fortress Alcatraz". These guided tours are available for visitors doing the day tours; they start at the dock and travel up the hill, ending at the prison. The people doing the tours are volunteers with the Park Service - folks who have a passion for the history of Alcatraz and enjoy sharing their knowledge. There is no fixed schedule for these tours. When you get to the dock on Alcatraz, check out the list of tours on the chalkboard to the right of the bookstore. They also post a list on the dock at Pier 33. Each tour lasts about 45 minutes. The last time I was there, they were scheduled at 10:00, 10:30, 1:00 and 3:30. I went on an "Escapes" tour, given by an entertaining guide (in "real life" a middle school history teacher) who told us interesting anecdotes about the escape attempts, along with some Alcatraz history. There are also free, guided, docent tours of the extensive gardens on Alcatraz, including tours of areas normally off-limits to visitors. Tours are Friday and Sunday mornings at 9:45 am, leaving from the Alcatraz dock (you would have to take the first or second ferry). Also, the Officers' Row area is open every Wednesday from 11 to 2, with a docent present for questions. 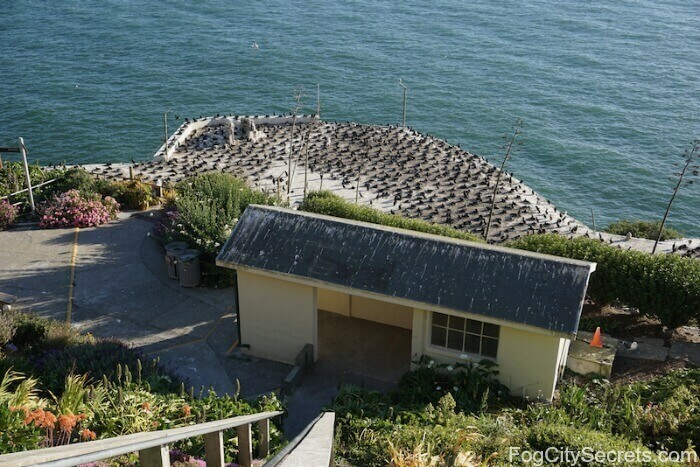 Thousands of seabirds use Alcatraz Island as a breeding ground. In spring, cormorants, gulls, and snowy egrets hatch their young here and you can see the nesting areas. Note: Construction and repairs. Alcatraz is starting to crumble from the effect of sea air on the metal frames of the buildings, so they're fixing up various sections of the prison. They recently completed some major repairs on the main cellblock building and repainted it, so the areas normally open on the day tour are all open again. The areas affected by the repairs are mainly those that would be available for the Behind the Scenes Tour, such as the prison hospital, underground tunnels, prison factory, etc. Consequently, that tour varies depending on what is accessible at the time, and it changes from day to day. If you aren't able to get tickets to Alcatraz, you can still get a good look at the island and the outside of the prison by taking an Alcatraz cruise. 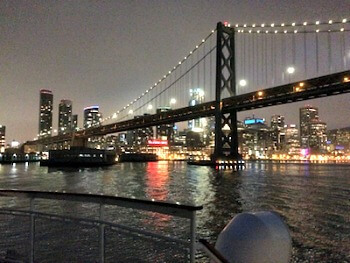 These bay cruises also take you out under the Golden Gate Bridge, a really a cool experience. 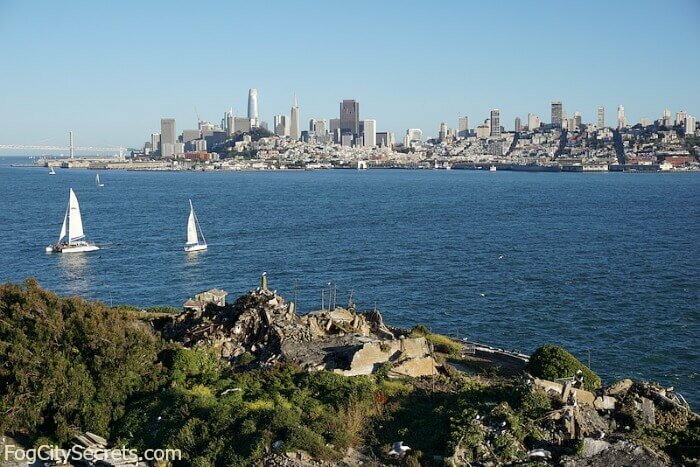 There are a number of bay cruises available that sail around Alcatraz Island, but don't stop there. You'll get a close-up view of the entire island as they circle around and most of them will give you some information about Alcatraz as they circle it. These are tours that have been around for a long time and have generally high ratings. Escape from the Rock Cruise. This is a nice, 90-minute bay cruise on the Blue and Gold Ferry that gives you a tour of San Francisco Bay and takes you out under the Golden Gate Bridge. 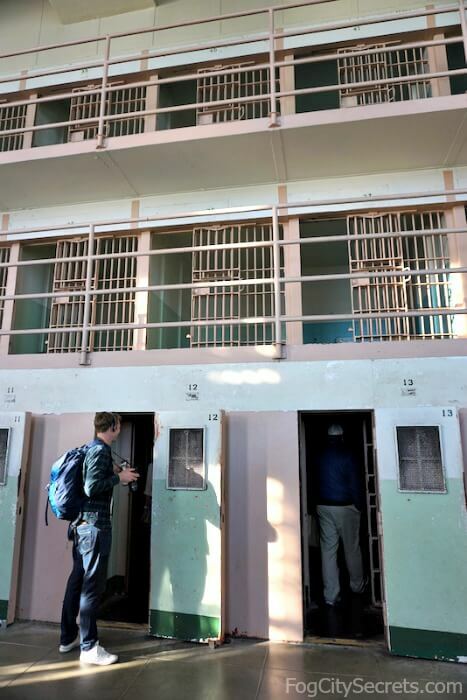 In addition, you'll circle Alcatraz Island and hear what Alcatraz was like for the prisoners and some stories of the more dramatic escape attempts. And with each child ticket, you get a pair of souvenir binoculars. Leaves from Pier 39. $34.99 for adults, $4 off if booked online. 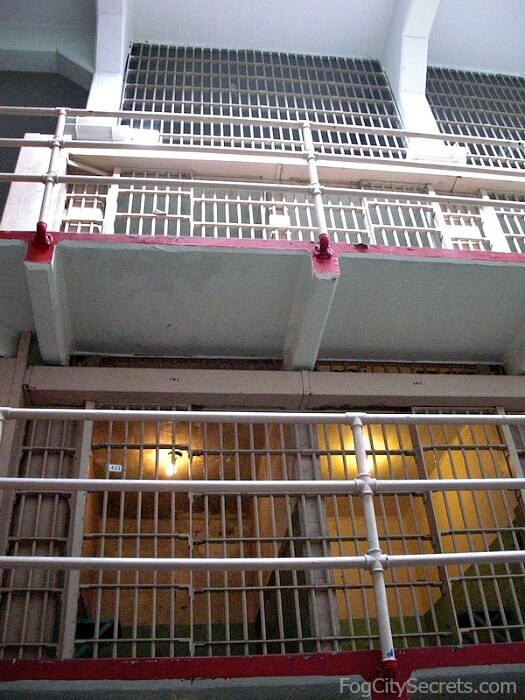 See Escape from Alcatraz tour for more info and booking. Blue and Gold Ferry. This is a one-hour bay cruise with a recorded narration about the sights that leaves from Pier 39. You sail past the sea lions, and head out to the Golden Gate Bridge. You go out under the bridge, then turn around and sail for Alcatraz, making a full circle around the island. Super views of the city skyline, Angel Island and both bridges. $28.99, $4 off if booked online. See Blue & Gold cruise for more info and booking. Fancy going out on San Francisco Bay in a sailboat? Catamaran Bay Cruise. This is another fun boat tour, sailing on a catamaran that takes the same route as the ones above: out under the Golden Gate Bridge, across the bay, and around Alcatraz. Being on a sailboat on the bay is a great feeling, plus you can buy drinks and snack onboard. Alcatraz and the bridge with a glass of wine...not bad! Audio tour available in 8 languages. $45, 90 minutes. See Adventure Cat cruise for more info and booking. Money-saving tip: goldstar.com often has half-priced tickets for these bay cruises. Go to goldstar.com to see what they have available. It's free to sign up. Alcatraz was supposed to be escape-proof. It had to be, because many of the prisoners there had already escaped from other federal prisons, and they were really bad guys. 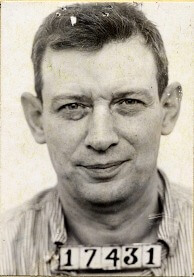 Most of the escape attempts resulted in death or recapture. But one in 1962 may have succeeded. The video below tells the story and describes recent evidence of what may have really happened to those three prisoners. See my page on visiting Alcatraz.